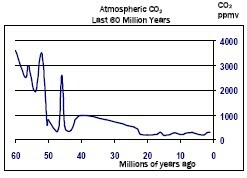 The central tenet of global warming theory is that the average temperature of the Earth is gradually rising due to certain gases occurring in small concentrations in the upper atmosphere. 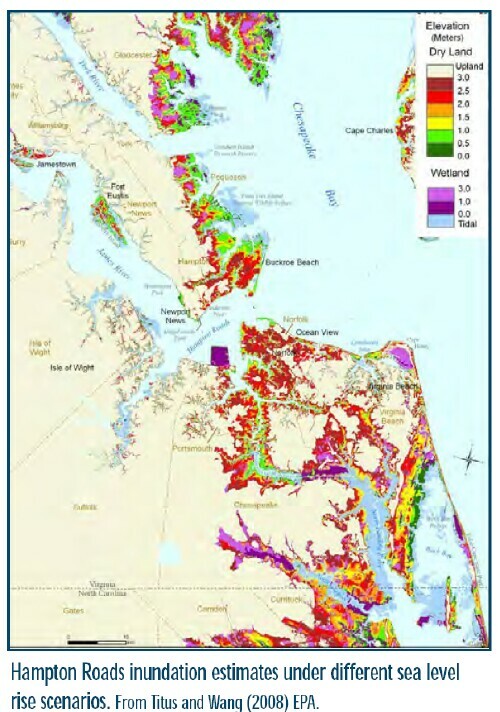 There are many consequences that occur when the average temperature of the Earth rises. 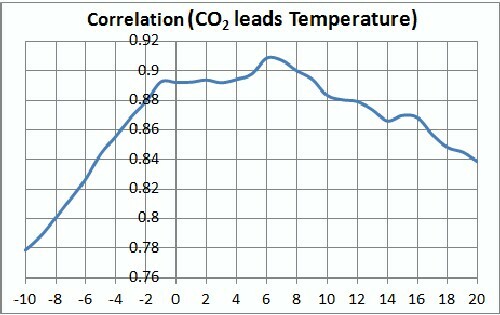 This article contains many graphs that depict the average Earth temperature and the consequences. 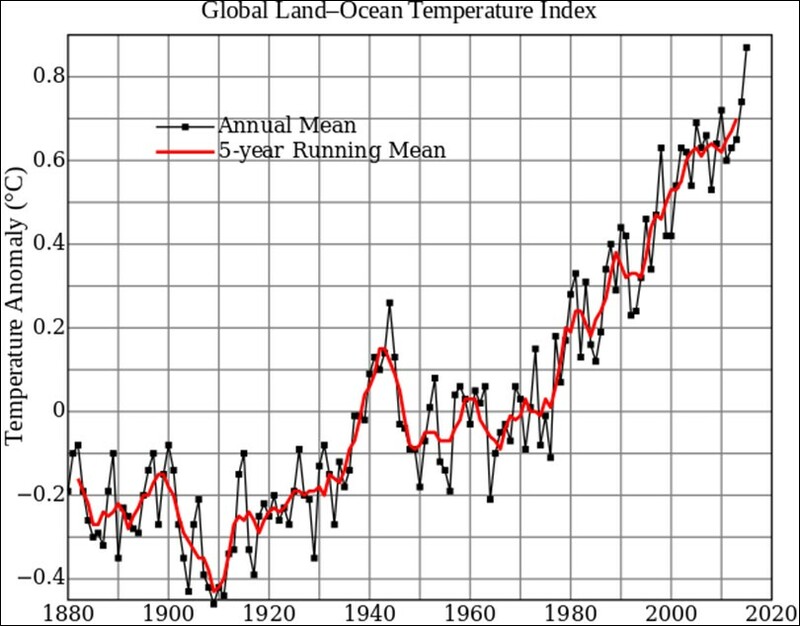 Average Earth temperature refers to the air temperature averaged over the surface of the earth. 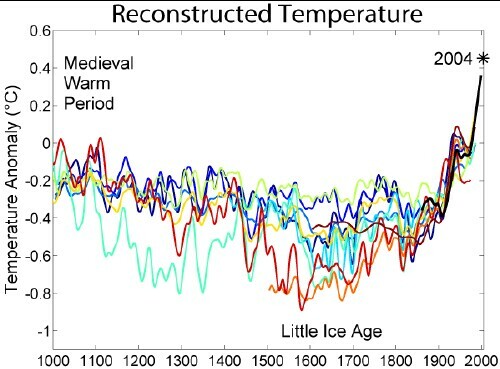 Some global-warming deniers claim that the average Earth temperature was higher during the Medieval Warm Period than it is now. The following graph shows that the claim is incorrect. 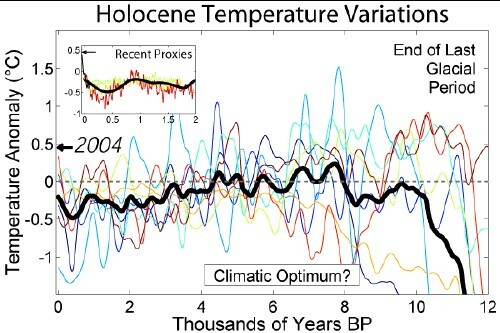 Some global-warming deniers claim that the average Earth temperature was higher earlier in the Current Major Interglacial (the Holocene) than it is now. 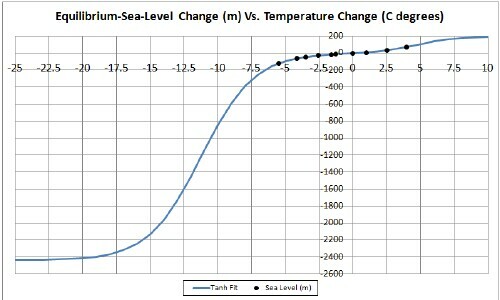 The following graph shows that the claim is incorrect. 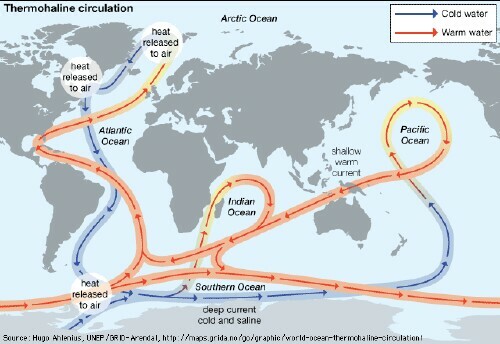 The average Earth temperature is about half the average Antarctic temperature. 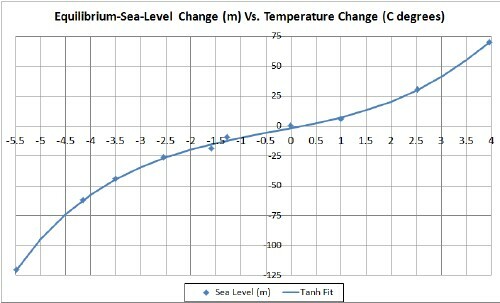 The graph shows that it was warmer (about 2°C) than now about 130,000 years ago (Eemian Major Interglacial) and the sea level was 5 to 7 meters higher than today. 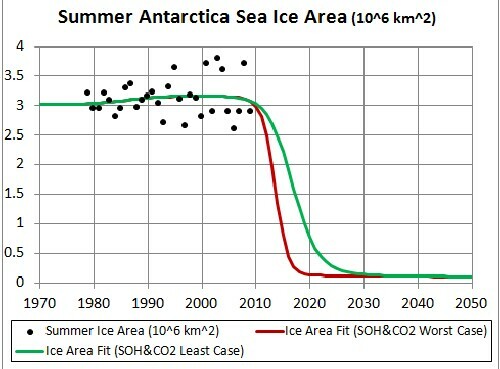 The insolation is projected 250,000 years into the future to give some idea of how average Antarctic temperature might vary then. 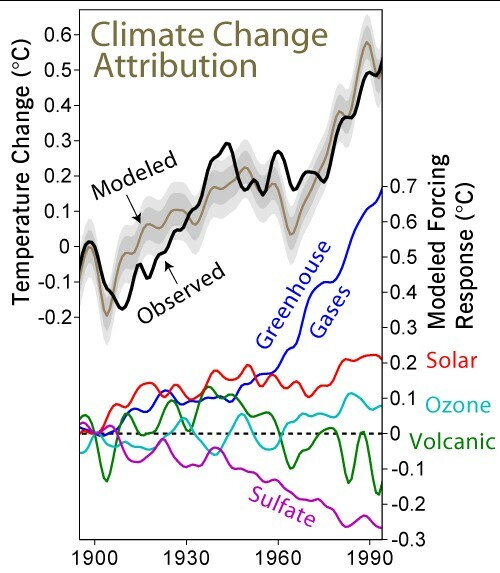 The graph shows that it was warmer than now during the last four Major Interglacials (~130,000 ybp, ~240,000 ybp, ~325,000 ybp and ~410,000 ybp). Note that the three panels on the right are expanded above. 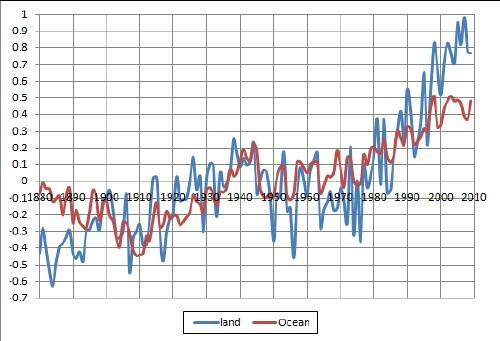 The Earth was much warmer than now from about 10 million to about 250 million ybp and from about 350 million to at least about 540 million ybp. The red dots are where glacial deposits exist; many are at the Equator! 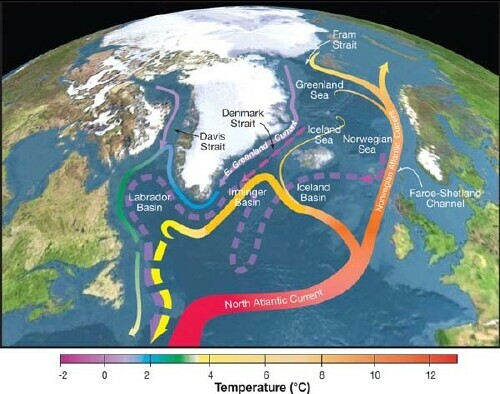 The extreme heat after Snowball Earth occurred because of volcanic activity and the fact that the oceans were covered with perhaps a kilometer of ice, such that they could not absorb the greenhouse gases emitted by the volcanoes. 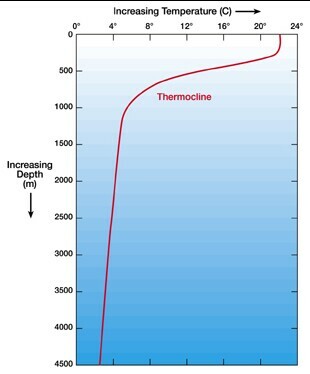 Deep ocean water is about 3.8 C and has a salinity of about 3.5%. The time of year appears to be about winter in the northern hemisphere. 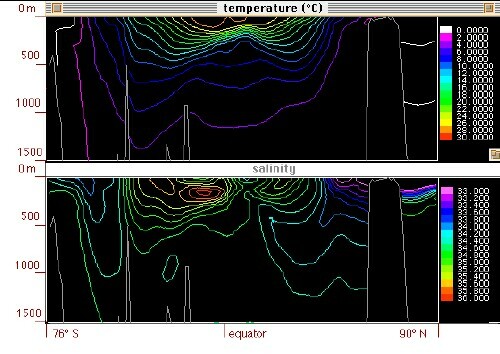 Note the lower boundary of the thermocline at about 500 meters. 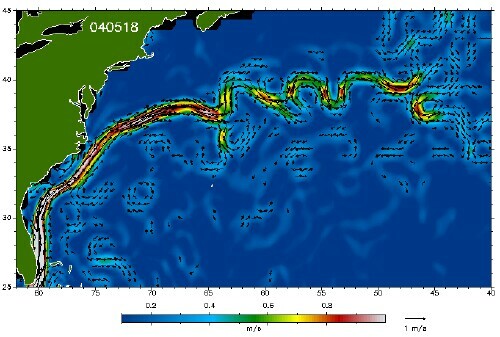 It has been shown that the wind speeds for tropical cyclones increase as ocean surface temperature increases. 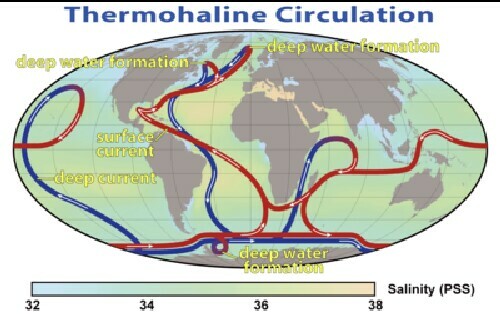 Global warming can disturb this ocean current by melting ice at the poles and thereby decreasing the salinity and, thus, disturbing the sinking. Also, warmer water at the poles carried there from the tropics disturbs the sinking. 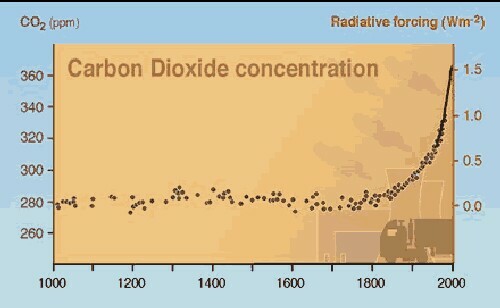 The main greenhouse gas is carbon dioxide. 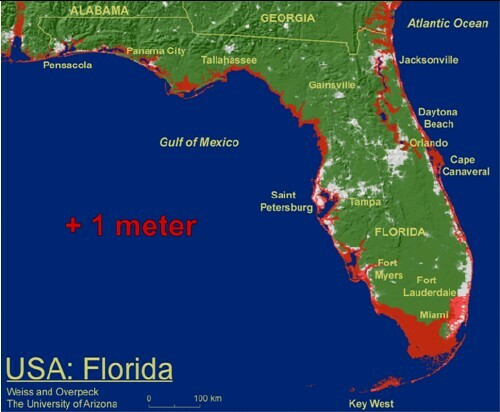 Methane converts to carbon dioxide with a lifetime of about 12 years. Carbon black in the atmosphere and on snow increases temperature. 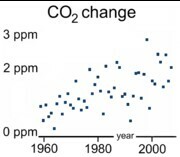 Atmospheric CO2 concentration (ppmv) measure at Mauno Loa, Hawaii. 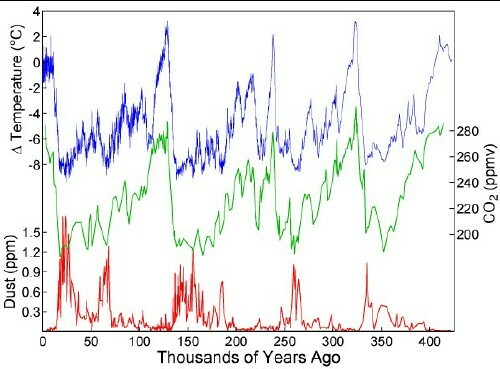 The Earth was very hot from 25 to 100 millions of years ago. 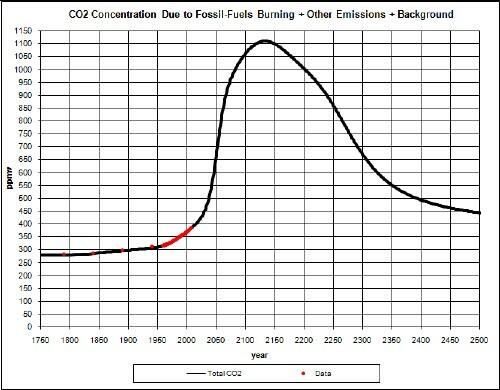 This graph shows an estimate of a "least case" total atmospheric CO2 concentration due to burning fossil fuels and non-fossil-fuels emissions plus a background of 275 ppmv before human intervention, with no saturation of CO2 sinks and no triggering of carbon emissions from the ground and oceans. 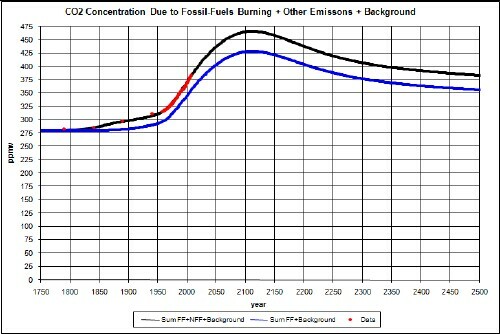 The blue curve is due to fossil fuels and the background only. 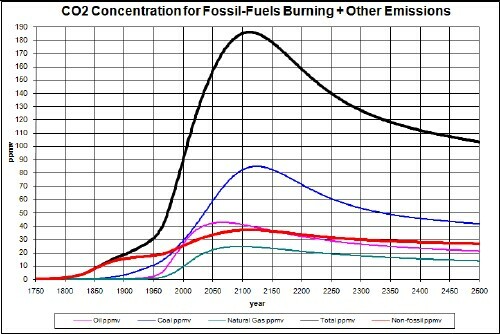 The top curve includes all other causes of carbon dioxide emissions. 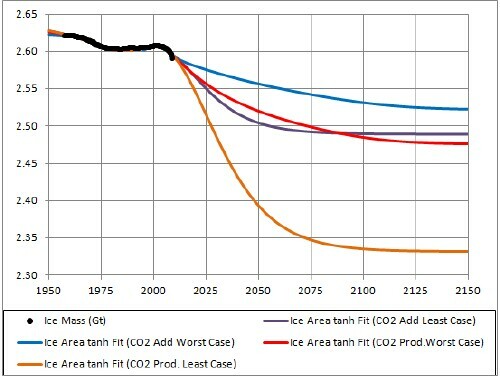 This graph shows as estimate of a "worst case" total atmospheric CO2 concentration due to burning fossil fuels and non-fossil-fuels emissions plus a background of 275 ppmv before human intervention, with saturation of CO2 sinks and triggering of massive carbon emissions from the ground and ocean. Note that the time lag is about six years. 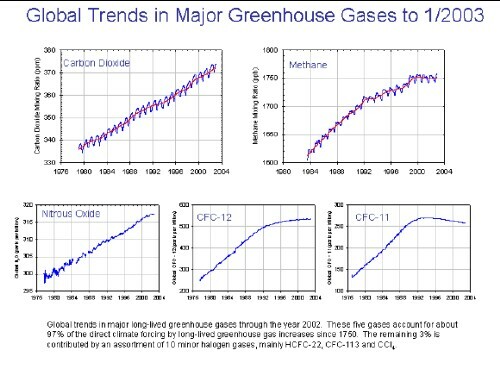 http://en.wikipedia.org/wiki/Greenhouse_gases: "Methane has an atmospheric lifetime of 12 ± 3 years and a Global-Warming-Potential of 72 over 20 years, 25 over 100 years and 7.6 over 500 years. The decrease in GWP at longer times is because methane is degraded to water and CO2 through chemical reactions in the atmosphere." 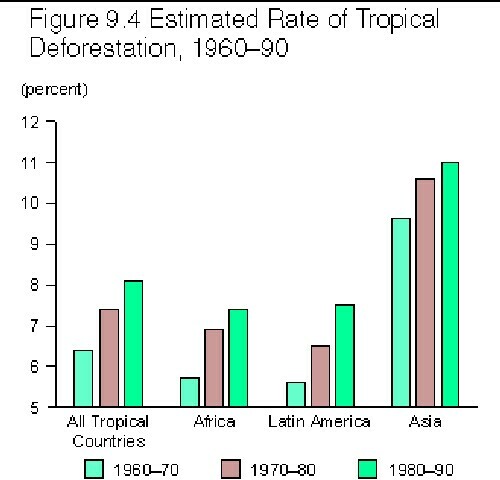 http://en.wikipedia.org/wiki/Deforestation: "...recent calculations suggest that carbon dioxide emissions from deforestation and forest degradation (excluding peat land emissions) contribute about 12% of total anthropogenic carbon dioxide emissions with a range from 6 to 17%." 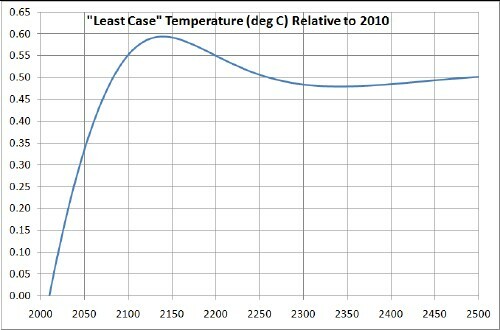 An estimate of the average Earth temperature for the "least case" total atmospheric CO2 concentration shown above, using a climate sensitivity of 3. 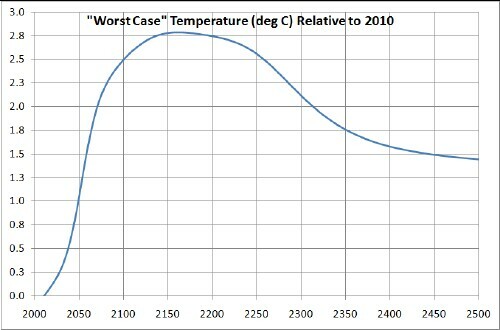 An estimate of the average Earth temperature for the "worst case" total atmospheric CO2 concentration shown above, using a climate sensitivity of 3. 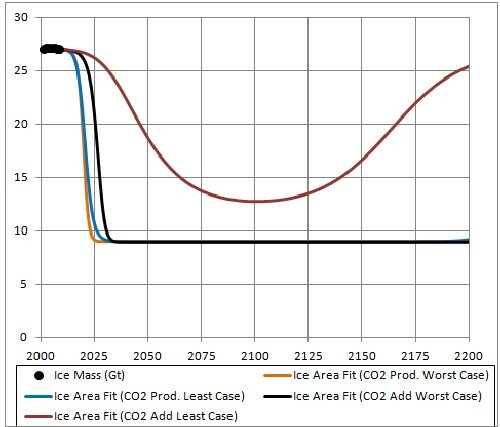 Increasing the climate sensitivity to 4 will increase the temperature by about 1C at 2200 and by about 0.8C by 2500. This dust is due to the dry conditions during very cold periods with high winds sweeping off of ice packs. 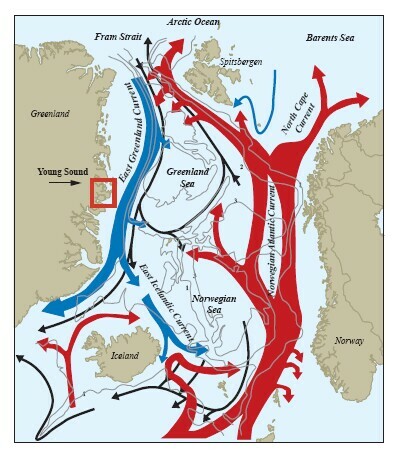 It also feedbacks to make the climate even colder. 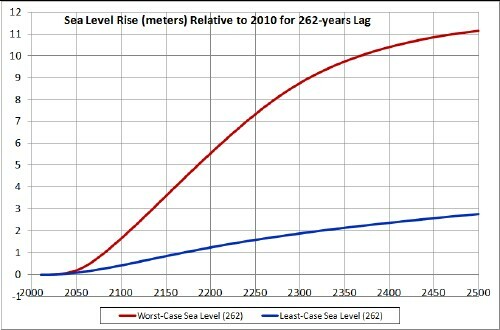 Long-term equilibrium sea-level rise, which can take hundreds of years to reach after temperature changes. 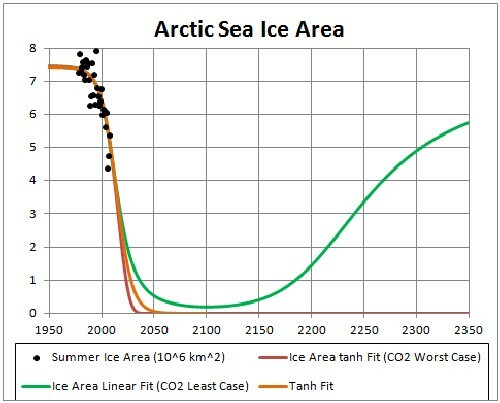 The two different cases are for two different scenarios of global warming. 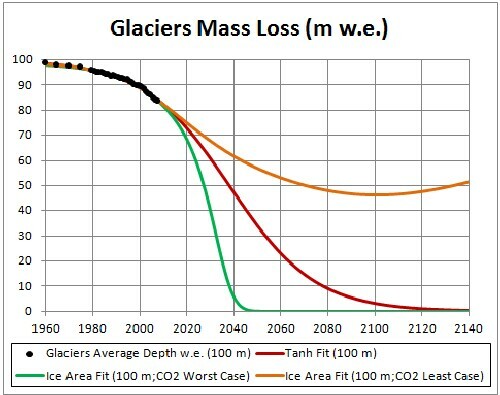 There are many ways to project the declining data for Earth ice masses into the future. Some of them are shown in the graphs below. 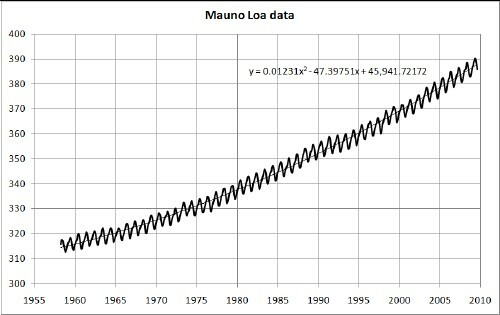 The flatness in the Antarctica-sea-ice data since 1980 are due to the huge ozone hole above Antarctica. 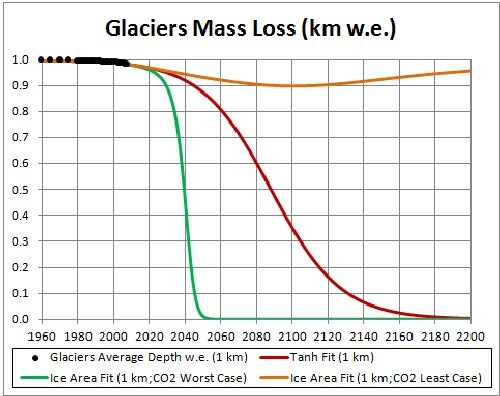 This does not include the Antarctic-sea-ice loss; for it see the graph above. 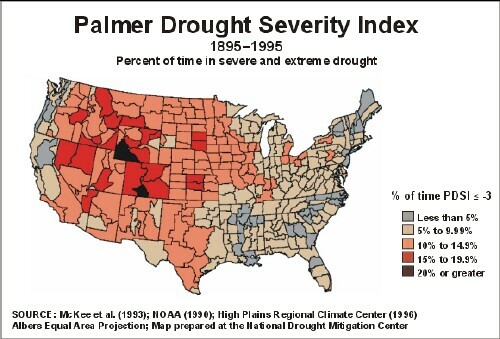 PDSI = Palmer Drought Severity Index. 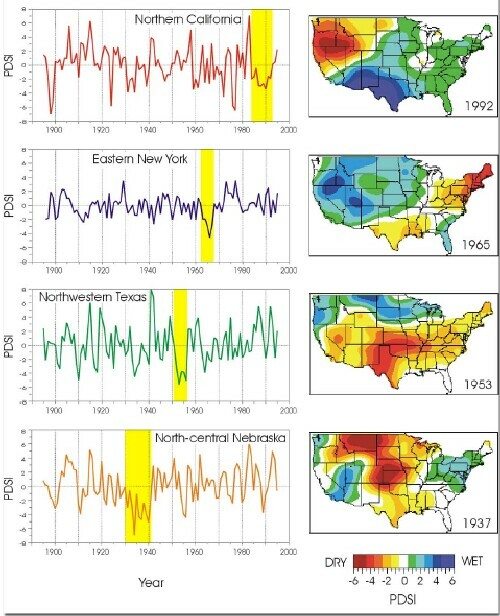 Severe droughts are marked yellow. -2 = moderate drought, -3 = severe drought, -4 = extreme drought. 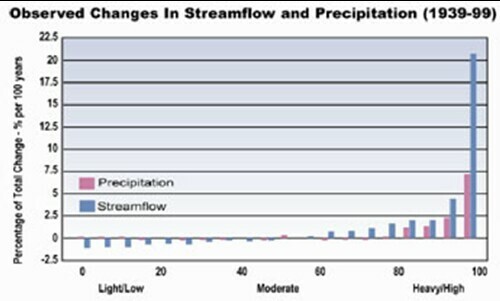 A more recent index of droughts is the Standardized Precipitation Index (SPI). 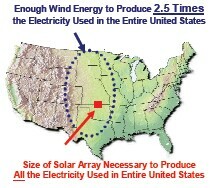 Water vapor in the upper atmosphere is a potent greenhouse gas. 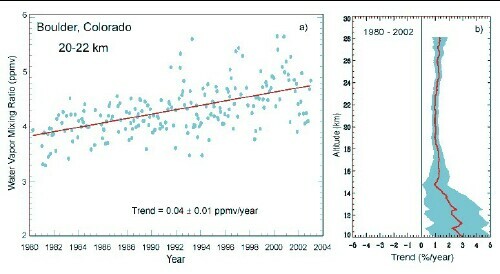 Water vapor in the lower atmosphere causes increased precipitation, therefore floods.